You are here: Home / Food & Drink / Bars / Shop Late Night in Lawrenceville is Tonight! 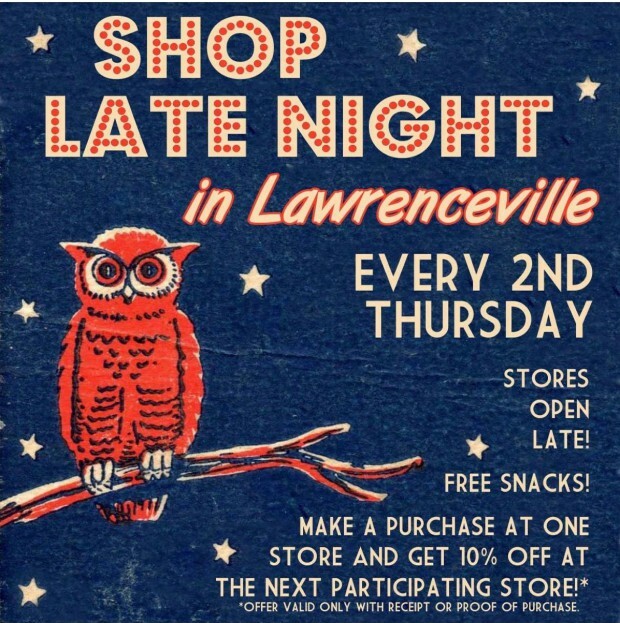 Shop Late Night in Lawrenceville is Tonight! Most of us don’t shouldn’t take off work early to go shopping – and there is nothing more frustrating than getting to your favorite store and realizing it closed while you were waiting for the bus. Fear not! While many shops in Lawrenceville stay open late every Thursday, shops and galleries will stay open until 9pm the second Thursday of every month as part of Shop Late Night in Lawrenceville (SLN). This year this event is better than ever with more shops, an online map, and specials at local restaurants and bars for SLN shoppers! Shop Late Night in Lawrenceville! Make a purchase at one store and get 10% off at another participating store with proof of purchase. After 9pm get discounts and specials at participating bars and restaurants with proof of purchase. Many stores will also have drinks and snacks available while you shop!